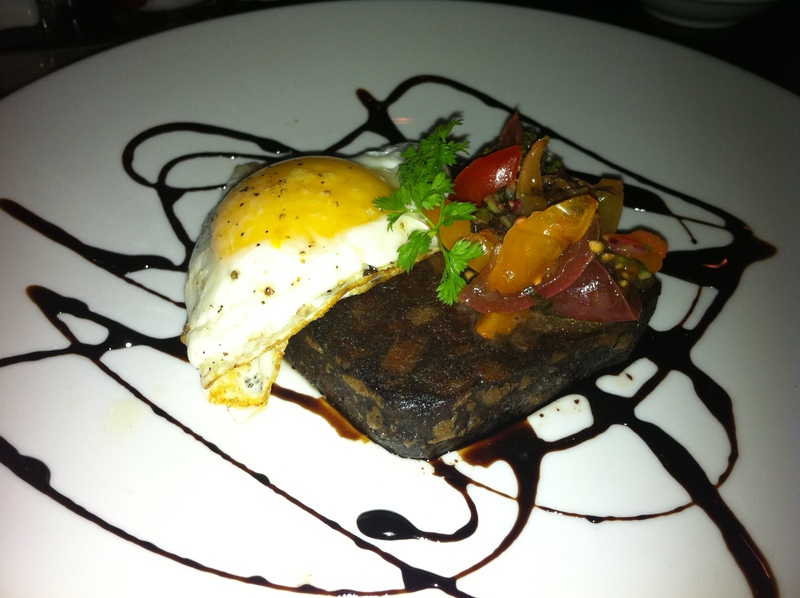 The appetizer that appealed to my unvegan sensibility the most was their Pan Fried Blood Cake, which came with fried organic egg and toasted pain poilane (which is just fancy-speak for toast). I wasn’t entirely sure what blood cake was, so before committing, I asked the waitress and she told me it was really like a cake made with pig blood and pig fat. I guess blood cake sounds a little better than fat cake, so that’s where the name blood cake came from. With a tinge of fear, I ordered it, still not quite knowing what to expect. When it did arrive, I was at first disappointed by the heirloom tomatoes upon my cake. I brushed these off and then took a look at the blood-splattered plate. Not exactly red velvet, the cake looked like Hannibal Lecter’s version of marble cake. Unlike your average cake, this was like a spread, which I wiped across a piece of toast. Then I took a bit of egg to put on top and bit in. Pure potato. 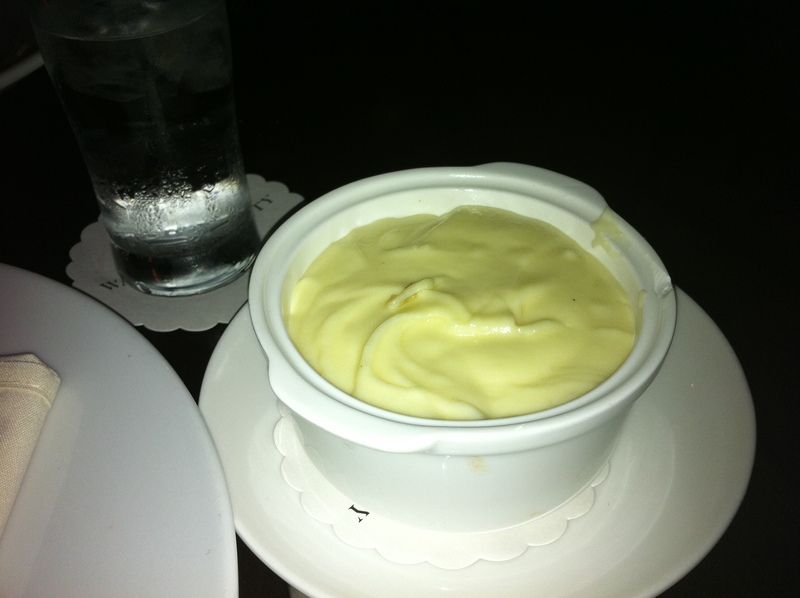 Also pureed potato. It’s kind of hard to explain the taste, which wasn’t bad at all, but also wasn’t especially good. It was kind of like a savory jam, where the bits of fat were like chunks of fruit and the rest of it tasted kind of like your own blood when you cut yourself. Do to my lack of experience with eating blood, I can’t really say if Waterloo & City did a very good job, but I can say I was glad I tried it and don’t really have any desire to try it again. Care for a bone in the pie? With the blood gone, I moved onto my main course, a Prime Beef and Bone Marrow Pie, with Potato Puree. Since this dish wasn’t on the normal menu, I kind of expected it to be some sort of mass-produced Shepherd’s Pie with marrow, but it turned out to be no such thing. Instead, it was a massive, yet individual pot-pie-looking dish that resided in a pan with a giant marrow bone sticking out of the middle. And the potato puree wasn’t even part of it and came on the side in its own bowl. Although the thing was taking forever to cool, I couldn’t wait and started digging in. Inside the delicious, crispy crust, I found some of the meatiest and tastiest pie-filling in the world. After some mild mouth and tongue burns, I found the beef inside this pie was perfectly tender, juicy and flavorful. Plus, every bite got a nice little spoonful of marrow, which add some nice gelatinous flavor to the already-perfect pie. The potato puree made an unnecessary, but delicious addition to the meal. 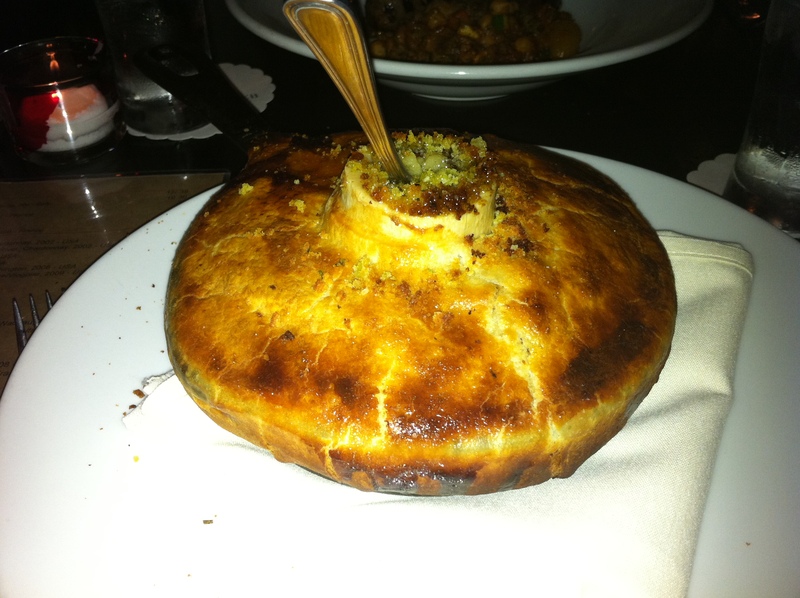 Where the pie packed a powerful punch of flavor, the puree sort of balanced the mouth out with a much simpler flavor. I also ate some of the House Merguez & and Slow Cooked Lamb Shoulder, which the girlfriend had ordered. 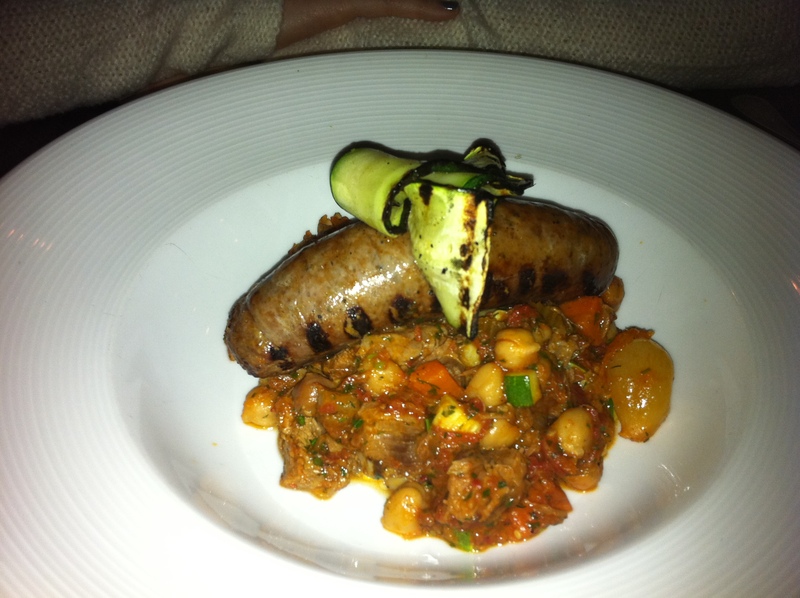 Unbeknown to us, the Merguez was actually a sausage. I would think an English restaurant would have food items written in plain English, but this was not the case. Luckily the sausage was tasty, but it wasn’t as good as the slow-cooked lamb shoulder, which was so tender it almost melted like butter in your mouth. I think we both would have liked if the dish had a higher lamb shoulder to sausage ratio, but it was still a nice dish. Finally, there were the desserts. Since there were only two choices, we each got one of them. The first was the Glazed Doughnuts with Jam and Custard. 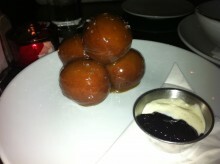 These looked more like doughnut holes, but also looked nothing short of delicious. Glistening in the dim light, I couldn’t wait to take a bite, and when I did I was not disappointed. Differing from normal doughnuts in the US, the English doughnut was less cakey and more bready. There was no lack of sweet, though, as the glaze was loaded with what I thought was caramelized sugar. The best part of the doughnuts actually happened to be the salt crystals that had been sporadically sprinkled upon them. This added a subtle, but much-needed balance to the doughnuts. 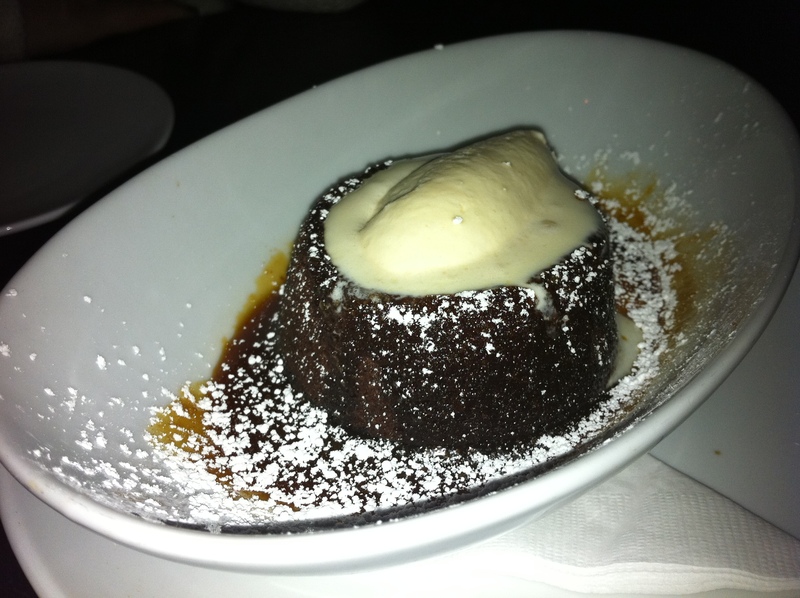 The second dessert was Sticky Toffee Pudding with Milk Ice Cream (didn’t realize there were other kinds of ice cream, other than vegan). By the time it arrived, the ice cream was mostly melted, so that was a bit disappointing. On the other hand, the toffee flavor was really good and almost made up for the ice cream. The doughnuts ended up being the better dessert, but had the ice cream been unmelted, the matchup would have fared better for the toffee pudding. My Restaurant Week experience at Waterloo & City was a surprisingly delicious experience. The surprising part was because it was English, but the positive reviews I had heard turned out to be correct.